Brown Pelican: Have you seen this pelican lately? The Brown Pelican (Pelecanus occidentalis) is the smallest of the eight species of pelican, although it is a large bird in nearly every other regard. The Brown Pelican occurs on coasts in the Americas from Washington and Virginia south to northern Chile and the mouth of the Amazon River, as well as the island of Saut d’Eau in Trinidad and Tobago. Some immature birds may stray to inland freshwater lakes. After nesting, North American birds move in flocks further north along the coasts, returning to warmer waters for winter. Their young are hatched in broods of about 3, and eat around 150 lbs. of fish in the 8-10 month period they are cared for. It eats mainly fish and amphibians as well as crustaceans. Groups of Brown Pelicans often travel in single file, flying low over the water’s surface. 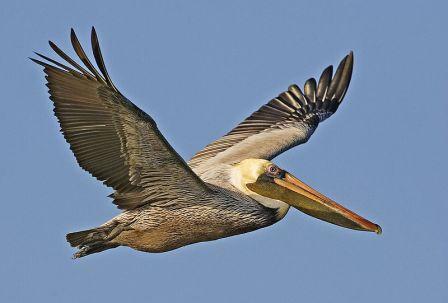 Along with the American White Pelican, the Brown Pelican is protected by the Migratory Bird Treaty Act of 1918. The International Union for Conservation of Nature’s Red List has listed the Brown Pelican as Least Concern since 1988.
bird quotations, bird quotes, I am like a pelican, Pelican. Bookmark.